Below you’ll find the Realista Mijas Costa area guide. It provides a general area of this popular area on the Costa del Sol, both for holidaymakers and residents. In the guide you’ll find information about the different areas in Mijas Costa, how to get to them and things to do in the area. We also cover beaches, restaurants and shopping. Mijas Costa in the centre of the Costa del Sol in southern Spain and stretches 12km along the Mediterranean coast from Cabo Pino in Marbella in the west to Fuengirola in the east. Calahonda – the largest residential area in Mijas Costa and almost a resort in its own right, Calahonda is very popular with holidaymakers and foreign residents. It stretches from the coast (the beach has blue-flag status) to high in the hills, north of the AP-7 toll road. A wide variety of property is available from studio apartments to luxury villas, and many homes have panoramic sea views. Services, located mostly around the A-7 road, are good with a range of shops including several supermarkets, banks and restaurants. Sports facilities include La Siesta Golf Club and Club del Sol tennis club. Riviera del Sol and Miraflores – Like Calahonda, these two areas are popular with foreign residents and holidaymakers. 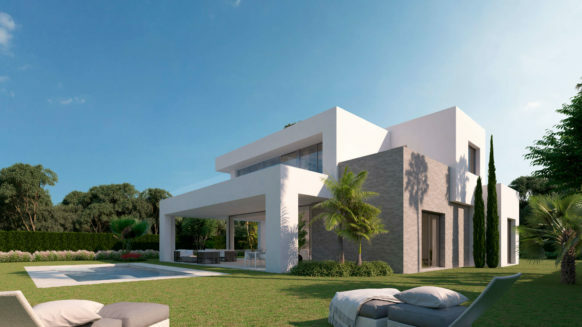 Properties in Riviera del Sol mostly consist of apartments and townhouses while Miraflores has several high-end townhouse and villa developments. There’s a selection of small shops, bars and restaurants near the A-7 road. Miraflores Golf and El Oceano Beach Club and Hotel are also located here. La Cala de Mijas – this small town is the main services and administrative centre for Mijas Costa. Once a tiny fishing village, La Cala has grown into a popular place to live and has a population of around 4,000 people. It boasts the best beaches in this part of the Costa del Sol, schools, medical centres and a range of shops and restaurants. A choice of property is available from traditional village houses and front-line beach properties to modern penthouse apartments. 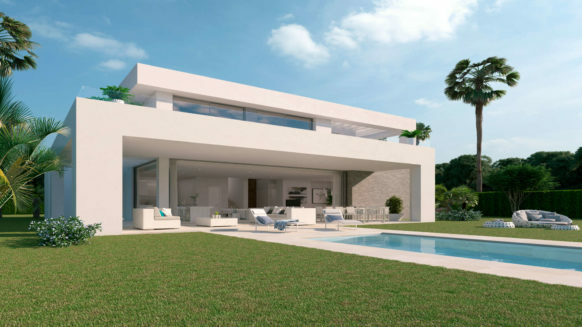 Several new developments are currently underway to the north of the town centre including Casa Banderas (apartments), La Valvega (townhouses) and Pueblo la Noria (townhouses and villas). 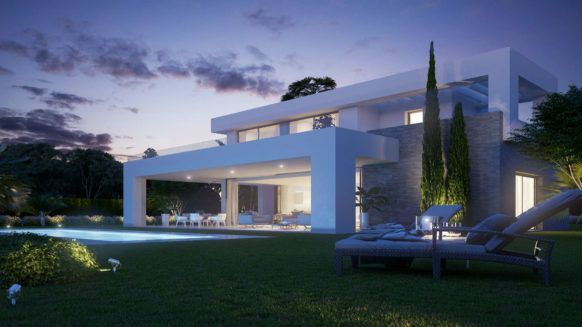 La Cala is within easy reach of some of the best golf courses on the Costa del Sol including Calanova Golf Club and the three courses at La Cala Golf Resort. El Chaparral and Las Farolas – the residential areas between La Cala de Mijas and Fuengirola are smaller than the rest of Mijas Costa. The two largest are El Chaparral, an area with mostly villa properties and home to El Chaparral Golf Club, and Las Farolas, situated near the lighthouse with townhouse and small villa properties. Services are limited although La Cala and Fuengirola are both within a short car journey. Mijas Costa is part of the municipality of Mijas, one of the largest in the province. Mijas Costa stretches 12km along the coast between Marbella and Fuengirola. What’s the population of Mijas Costa? Approximately half of the population of Mijas (86,700) live in Mijas Costa. How many foreigners live in Mijas Costa? Mijas Costa is one of the most popular places to live in Spain and has a large foreign population. Over 31,500 foreigners live in the municipality of Mijas with the majority in Mijas Costa. British nationals make up over a third of the total. What’s the weather like in Mijas Costa? Like the rest of the Costa del Sol, the weather in Mijas Costa is one of the best in Europe. There are over 320 days of sunshine a year and the average temperature is 18 degrees. How do I get to Mijas Costa? Getting to Mijas Costa is easy. The A-7 highway runs the length of Mijas Costa and all the main residential areas have easy access to the road. The AP-7 toll motorway has an exit at Calahonda on the stretch between Marbella and Fuengirola. How far is it to Malaga Airport from Mijas Costa? Malaga Airport is 35km from Mijas Costa (La Cala), a journey that takes less than 30 minutes by car. How far is it to Gibraltar Airport from Mijas Costa? If you’re travelling to Mijas Costa from the UK, Gibraltar Airport offers an alternative to Malaga Airport for flights. La Cala is 96km from Gibraltar Airport, around 1 hour 10 minutes by car. Allow extra journey time for crossing the border between Gibraltar and Spain. How far is it to Marbella from Mijas Costa? Marbella is 28km from La Cala and it takes around 15 minutes to get there. What about public transport on Mijas Costa? A regular bus service (approximately every 30 minutes) runs between Marbella and Fuengirola, and has plenty of stops along Mijas Costa. What are the main attractions in Mijas Costa? The advantages of Mijas Costa include quiet residential areas within easy reach of the busy resorts of Marbella and Fuengirola; excellent services and facilities; and a good range of property, often at more affordable prices than nearby Marbella. Mijas Costa is famed as a family-friendly place to go on holiday or to live. One of the main highlights of the year in Mijas Costa is the fair at La Cala that takes place over five days towards the end of July. The family-friendly festivities include dancing, horse processions and a funfair. Mijas Costa doesn’t have as many attractions as other resorts on the Costa del Sol. However, its location – equidistant between Fuengirola and Marbella – means it has the best of the Costa del Sol on its doorstep. What are the beaches like in Mijas Costa? 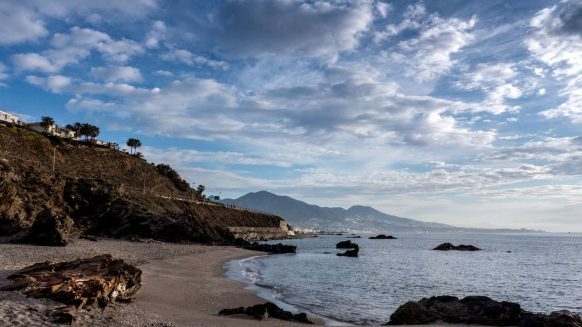 There are 15 beaches in Mijas Costa and 3 have blue-flag status. The beaches range from long and sandy such as those in La Cala to small pebbly coves. Some of the smaller beaches are among the quietest on the Costa del Sol. Mijas Costa residential areas are all within easy reach of the beaches in Marbella and Fuengirola. What about eating out in Mijas Costa? There’s a good choice of restaurants in Mijas Costa, particularly in La Cala and Calahonda. Popular Spanish venues include Vinoteca Pura Cepa and El Olivo in La Cala, and Mesón de Calahonda and Acinipo in Calahonda. There are also plenty of restaurants serving international food such as El Gusto in La Cala, El Oceano in Miraflores and Max Beach in Riviera del Sol. You’ll also find some of the best fish and chips on the Costa del Sol and several good Indian restaurants in Mijas Costa. What’s a typical local dish? Like the other resorts on the Costa del Sol, one of the most typical things to eat in Mijas Costa is fried fish, known as pescaíto and served at the beach bars and restaurants. A typical dish specific to Mijas is the local salad made with potatoes, cod, oranges, onions and olives. How about shopping in Mijas Costa? You’ll find a good choice of shops in the larger residential areas in Mijas Costa. Calahonda and La Cala both have several supermarkets including Supersol, Mercadona and Lidl. La Cala has a selection of small food shops and the weekly market takes place on Wednesdays. Banks and other shops such as pharmacies, newsagents and hardware stores are also available at La Cala and Calahonda. La Cañada (Marbella) and Miramar (Fuengirola) shopping centres are within a short drive and Decathlon, Dunnes and Iceland stores are also located at Fuengirola.